That “third Robert Johnson photo”. This photograph is supposed to show blues singers Robert Johnson (with guitar) and Johnny Shines. However, if you look at the man on the right (“Johnny Shines”), you’ll notice something odd about several details of his clothing. Here’s an enlarged and enhanced section of the photo. Perhaps the photo is supposed to be this way around? Now he’s wearing men’s clothes and all the details are correct. Maybe it’s not Robert Johnson (or Johnny Shines), after all. The Robert Johnson Estate commissioned Lois Gibson (a police forensic artist) to authenticate the photo, which she duly did (see Vanity Fair, October 2008). Her research compared the features of the face in the new photo with those on the two other authenticated photos of Robert Johnson. She was able to superimpose one on top of another and declared the result “an almost perfect fit”. Ms Gibson obviously didn’t notice that the photo had been reversed and since none of the faces in the three photos under analysis is symmetrical, surely her conclusions and her “authentication” of the photo must now be in serious doubt, to put it mildly. There has been a lot of discussion and argument about this photo and the disputed identification of the subjects. While stories about a “third Robert Johnson photo” have appeared in many mainstream magazines and newspapers, these have been based on a press release by Getty Images, who control the licensing rights. However, it seems impossible to find anyone with knowledge/experience in the blues world (like fellow musicians Robert Jr Lockwood and David “Honeyboy” Edwards who actually knew Johnson and Shines1 or authors, researchers and journalists) to agree with Ms Gibson’s conclusions. If another supposed photo of Robert Johnson should ever surface, we can only hope that the Robert Johnson Estate will do proper and thorough research before deciding to authenticate it. Why don’t you zoom in on the label of the guitar (Dobro?)? You’ll directly what’s the right side of the photograph. Also notice the small finger has a ring. No guitarist who plays often would wear a ring that would rub on the guit neck. He simply fliped the guitar over so it would not block out his fancy friend. Lots of guitarist wear rings on either hand while playing (without effect), and since it is a posed photo, there is no reason to believe the guitarist didn’t “bling it up” and wear a ring he might not have worn while playing, so your comment has no meaning either way. I’m just watching a Johnny Shines video on YT with Mr. Shines playing with a ring on his left (neck) hand (with one ring on each hand, to be fully accurate). So much for guitarists and rings. robert johnson in other photos has one messed up eye, making it look like one eye is smaller than the other. if you don’t believe me then take a look, http://theiridium.com/wp-content/uploads/2013/09/robert_johnson_-_fan_art-1.jpg . in the original photo, that eye is on his left side, like the other photos. but if you flip the photo the eye is on the wrong side. The person purported to be Shine, may be wearing a suit made by a female seamstress rather than a male tailor. I don’t think one can make a definitive determination one way or the other from the evidence you cited. Agree! Furthermore, often clothes were available for photo purposes. It’s certainly unlikely that any self-respecting, fashion-conscious young man (as is, quite clearly, the one in the light-coloured suit in this photograph) would wear clothes that buttoned on the ladies’ side, but it seems just as unlikely that the man who is now generally recognised as one of the finest guitar players of his generation, and by all accounts took great pride in his abilities, would pose with a battered guitar, which has neither strings nor tuning pegs. Robert Lockwood described himself as Robert Johnson’s stepson, and knew him well. He was also a long-time performing partner of Johnny Shines (into the 1980s). Honeyboy Edwards knew both Shines and Johnson well, and was with the latter on the night he died. It’s inconceivable that either Lockwood or Edwards, shown a photo of the two men together, would fail to recognise them. The night he was poisoned, not died. He took some time to eventually die – up to twp weeks by some accounts. Just wanted to make a quick comment about the picture and the clothes being the wrong way. This happens a lot with this early photography . A tin-type photo is created with a reverse image. This messes things up in terms of how the musician is holding the instrument and the smaller details. If you stand before the camera, a right-handed guitarist, the camera will take the photo with a reverse which will look like you are left-handed. This is the photo can be reproduced more efficiently but it creates a problem of continuity in regards to the fact that you will look left-handed in the photo instead of right-handed. What people used to do was hold the instrument upside down so that when the image was created it “looked” like the player was holding the instrument the right way when it was on display for people. So more than likely the guitar is being held left handed so that when the picture is snapped the reversal will almost cancel itself out. Obviously things like clothes will not change which is why it is reversed. Check a few tintypes of banjo players coming into the late 19th century and early 20th century. You’ll see their 5th strings (little drone string) facing down as they are attempting to compensate for the reversal. I have also taken pictures with this old-time photography and had the same problem. Good detective work but I don’t know if your points are truly not founded. The technology is flawed in a way that can explain why the details does not sync up. I also saw the comment on the battered guitar. There guitar props in every studio. Why did Robert and Johnny not have a guitar at that moment is anyone’s guess but there would have been a prop guitar if they so chose to use one. Yes, teh guitar a studio prop. My question is why somebody who cared that much about his music would have wanted to be photographed holding such a useless item, but I acknowledge that’s a subjective position. What’s ironic is that if it hadn’t been in the photo, the person who found it (and thought it was a young B B King) probably wouldn’t have looked at it twice. Thanks for the comment, Dom (and the fine music you make). Of course, you’re correct about tin-types and the way other early photo techniques printed mirror images but this photo was taken several decades after the introduction of celluloid film and the reversal seems to have been a mistake made during the developing or printing process. As you say – it wouldn’t explain the inconsistency of the clothing. Don’t want to belabor the point but from what I can see this shot does not look like a celluloid photo. This looks like a formal portrait which may or may not be a tintype or a related photo technology. I also have never seen the photo in person so i can’t tell for sure. I think it was the 40’s before people have ready access to film cameras. Anyway, I threw out my two cents and will leave it at that. Great article! There are a whole host of things wrong with this photo, for starters check out “Robert’s” hands, his index finger appears to be broken or disjointed. The background also appears to have been altered. The prop guitar doesn’t bother me nearly as much as the watch on “Shines” wrist, which appears to be on the wrong arm in the so-called authenticated photo. There are far too many things wrong here to pass the smell test… let’s keep searching. Dom, That would be fine if this were a tintype, but it’s a photo allegedly from the 1930s… the type of reverse image you mention would not have happened with the photography available at that time. As was pointed out by someone on a forum I belong to, perhaps the reason the Robert Johnson Estate has supported this image is because it would be something they do not have to ‘share’ with Steve LaVere. There are enough differences in facial structure alone to question the possibility of it being the *same* Robert Johnson that we see in the familiar ‘dimestore’ image as well as the professionally-shot ‘Hooks Brothers’ studio portrait. The apparent flaws in this image lend even less credence to the efforts of Lois Gibson. As mentioned, Robert Johnson took enough pride in himself and his avocation as a musician to have had at least one professional image of himself, so I sincerely tend to doubt that he’d have posed with the useless prop guitar we see here. Add the reversed clothing and you surely have enough circumstantial evidence to oppose Lois Gibson’s findings. Another problem for me is the style of clothing the man identified as Johnny Shines is wearing. For all intents and purposes, that resembles a ‘zoot suit’ and probably without much question, which also raises more suspicion with Lois Gibson’s identification. If that IS a zoot suit, and I can’t think of what else you could call it, it becomes a problem dating the image to August of 1938or before. It is strongly believed by numerous fashion experts that the ‘zoot suit’ made its entrance into American pop culture, either in 1939 or 1940, following the premiere of the film, “Gone With The Wind.” Robert Johnson was dead in August, the Summer of 1938. How could “Johnny Shines” be wearing a zoot suit when that style hadn’t yet been introduced? The writing on the wall is clear, this simply isn’t Robert Johnson. Furthermore, having known Johnny Shines, the man in the light-colored suit bears no resemblance to the Johnny Shines I knew and saw play numerous times from the late-1970s through the 1980s. If the RJ image was reversed, wouldn’t his other eye be squinty? Maybe the most telling feature that this isn’t Johnson is the fingers. Looking at the enlarged sections, this person has rather normal, if not slightly thick fingers. They certainly do not resemble Johnson’s characteristic long, bony, almost spider-like hands. This reminds me of the old proverb: Whatever the question is, the answer is money. Of course their his fingers…..they’re F###ing MASSIVE you idiot!! New Robert Johnson pic.. AT LAST!!!!! One thing that hasn’t been pointed out that seems to indicate even further that the photo has been doctored is that the upper left hand corner of the photo is a mirror image of the upper right hand corner. Also the lighting and shadows do not fall correctly. Also, the “Shines” character is almost certainly sitting on something. A photo analyst has hypothesized that these were two separate photos of these men that were superimposed on each other with the “Shines” character’s photo reversed to make it look like both men were in one photo. There can be no other explanation why the upper corners are mirror images of each other and why Shines’ buttons are all on the wrong side. OH,just SHUT UP F.F.S. It’s him!! Johnson WAS tall! check your facts,fool!!!!!!!!!!! It is a great article and this debate is interesting enough to have got me here but genuinely over the last few days i feel quite laboured by all this conjecture over Robert Johnson i been reading and coming across. Is the photograph really RJ and Johnny Shines? … and the other thing i keep seeing is, were Roberts original recordings speeded up? … who knows? …. and who cares really?. This photograph is interesting at a glance but just isn’t as special or as good a portrait as the two certified ones and the result of loads of amateur musician producers slowing down his music on rubbish equipment just sounds … rubbish and really winds me up. In contrast the discovery of the a young Honeyboy Edwards photograph a few years back, when he recorded in 1940 for Alan Lomax i find fascinating, because its a really cool and brilliant natural shot!!! (it sticks in my mind) … this one of the two guys above is average i feel and for me dulls the mystery so personally i’m counting it out. It IS Robert…and,NO,the recordings were NOT speeded up!!! If it is a tin plate picture it will be reversed, same as the one of Billy the Kid that has him a southpaw. The photo was taken in the late 30s or early 40s… no way would it have been a tintype. Been checking around in the net…Johnny Shines met up with Robert around 1935, Robert had gone through the loss of a wife and baby 1930, Johnny claims Robert was a rambler at the time they met, they played around in streets, hitchhiked on train wagons, both drinking now and then and Robert used to loose control then; it was bad for him as Johnny claims.This guy on the photo that i supposed to be Robert doesn´t look at all chastened to me, he has a bit of a “baby face” to me, not really the man who sold his soul to the devil as the story goes; I don´t think the face is looking like Roberts; to look for special details I see that Roberts eyebrow on the “good eye” side is going diagnally upwards, but on this photo both eyebrows are bowed like half moons; on the supposed guy; on the ” not so good eye ” as they say, Roberts eyebrow is rather straight and sits a bit lower: further the root of the nose is broader than on the supposed guy. There are black people that have long fingers and big hands, Chuck berry has and Jimi Hendrix had; BB King always tells he has not and therefore cannot play in ways he would have done if he had have…so and so..what I´m aiming at is that it´s not only Robert who had big hands and long fingers; from what I can see on pics on the Robert we know, he has thinner fingers than I find the supposed guy to have…thanks for now and drive carefully! 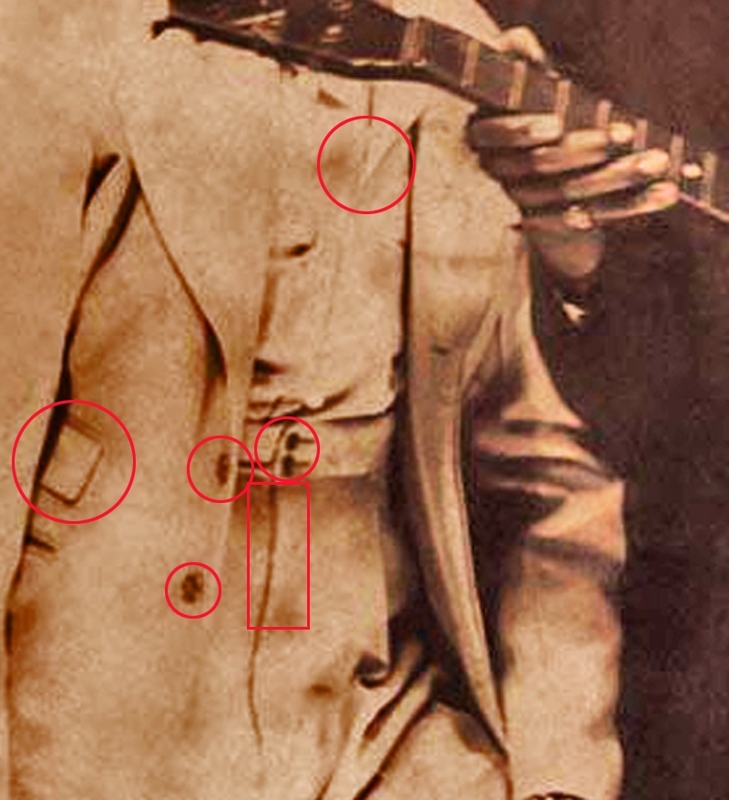 B – instead of comparing the features of this man in the third picture to only two known photographs of robert johnson (which may or may not be reversed for all we know), why not compare them to the bevy of photographs that exist of johnny shines to determine if the picture is truly reversed? According to Mack McCormick (who should know) it’s not even certain that the Robert Johnson in the first two photos is “the same guy that made the records”. Dear Huw Jones – thanks for your “passionate” comments (all nine of them). Dude…why the hostility and name-calling here? I mean, at least you haven’t blamed President Obama (yet), but your constant honking and bleating is tiresome. Lots of opinions and insights have been offered in this thread, some of them have merit, some may not. Your comments offer no evidence of thought, just a dogged determination that your assessment of this photo is correct, and everyone else is an idiot. So, let me ask you, what color is the sky in your world? I just want to add another thought about the photo being reversed. In the “original”, the stripes of the tie fall from the left shoulder. That is the way British ties were made, and the colors of the stripes signified the wearer’s military or university affiliation. In 1920 Brooks Brothers introduced their own striped (or “repp”) tie, with the stripes falling from the right shoulder. British and European ties continue to be made falling from the left, and most American ties fall from the right. This is an American tie, so it should fall from the right. 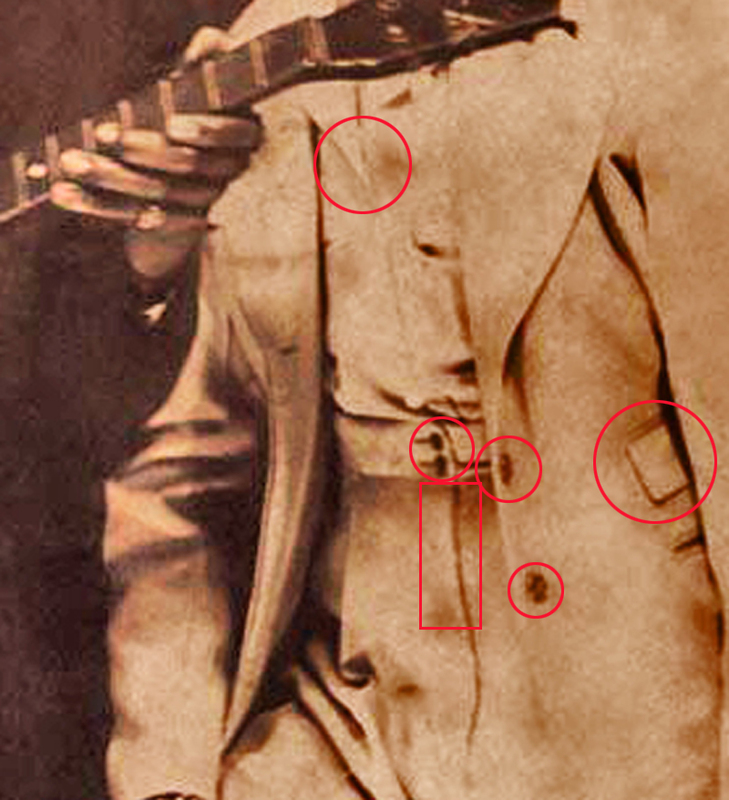 Adding this evidence to the “wrong way” buttoning/fly/ticket pocket of the light-colored suit and shirt, there is NO QUESTION that the photo is reversed. worth also noting that Johnny shines always wears watch on left wrist in other pics. In this pic it’s on the right. My name is John Kitchens and I am the attorney for the Robert Johnson Estate. I have just finished reading the above comments, dating back to May 13, 2013. I am not going to address all the comments, but will hit a few of them and let the community know how we got where we are now with respect to the photo. Zeke Schein discovered the photo online and contacted the Estate to authenticate. Claud Johnson, Robert’s son, was unable to identify the man in the photo because he was very young the times he saw his father and was unwilling to do so because of the issues we have had with the two other known photographs. David “Honeyboy” Edwards and Robert Lockwood, Jr. were unwilling to look at the photo. There was no one else familiar enough with Johnson to make the identification. The Estate needed to know, one way or the other, whether it was Johnson. My search for an expert led me to Lois Gibson, who has been somewhat attacked in this thread. Ms. Gibson is perfectly capable of defending herself, but I will point out that she has been identified as “The World’s Most Successful Forensic Artist” by the Guinness Book of World Records for a reason. I have always thought the photo was a tintype, explaining how the buttons, etc. on the other man’s clothes are backwards. Regardless of what photo technology was available at the time the picture was taken, we know that tintype technology was still being used during Johnson’s lifetime. The Dime-Store photo was tintype. We have not given any attention to the lack of guitar strings. This was obviously, in our opinion, a prop guitar. Regarding the way he was holding the guitar, as someone else mentioned, it was not uncommon for artists to hold the instrument in reverse so as to give a natural look when the reverse image was printed. I will not pretend that the Estate did not want this photo authenticated. This was not the first photo that has come along claiming to be a new photo of the legendary bluesman we all love. This is, however, the first photo that the Estate has gotten behind and endorsed. We didn’t take a survey asking whether people thought this man looked like the same man in the other two photos. Instead, we hired the world’s leading expert to do a scientifically-backed analysis. Ms. Gibson was not hired to study the significance of left-sided vs. right-sided buttons or stripes on a tie or a ring on a finger or strings on a guitar. She was hired to analyze distinct facial features – the things that don’t change based on the type of film used, etc. For those who cannot accept this as Robert Johnson, I’m sorry. We thank those of you who recognize this as Robert Johnson and hope you realize the months-long process involved in authenticating the photo. We thank all of you for your interest in the life, legacy and music of the King of the Delta Blues Singers. Thank you for your comments – however, they raise several further queries. Perhaps you can answer the following three questions? The first two relate to statements which seem to contradict directly the Vanity Fair article “Searching For Robert Johnson” (November 2008 – link in blog above). So – is the Vanity Fair article wrong? (3) Finally – since the Robert Johnson Estate now appears to accept that the photo is reversed, could you please comment on this question (raised above in the blog)? Never trust anything by this phony “forsenic expert” Lois Gibson as she calls herself. She is known to doctor up photos and make fraudulent claims that they are the real deal..
Here’s a new curveball ….. Robert Johnson died ( according to Wikipedia ) in Aug 1938 …. the guy supposed to be “Shines” is , in fact , sporting a ” ZOOT SUIT ” & wide-brim fedora … a ‘hip’ dress style which first appeared in 1940-41 …. ! ! ! Maybe the last photo is after the deal with the devi and he started playing from the sinister side. The 3rd photo has definitely been doctored with and looks like a composite of 2 separate photographs.. The only reason for this is likely that someone has done his best to reproduce the picture of Johnson and Shines together that had been rumoured to exist. you are correct.. This was faked up by this witch Lois Gibson who try to con everyone that her doctored photos are real.. Never believe any claims by Lois.. She is a FRAUD! Here’s an article about the forensic expert who authenticated the photo. dressed up for the shot…on the road, your best duds might not make the cut. Bet if you ran with these masters you had plenty a folk about more than happy to lend a hand…Look a little closer to Johnny’s suit and you ought to be able to notice the fit is at least a couple sizes too large. No, but the pants look tailored for a womanly frame too…No doubt, and I’m no expert, just a man of the house, yet I can tell that! Thanks for your comment. 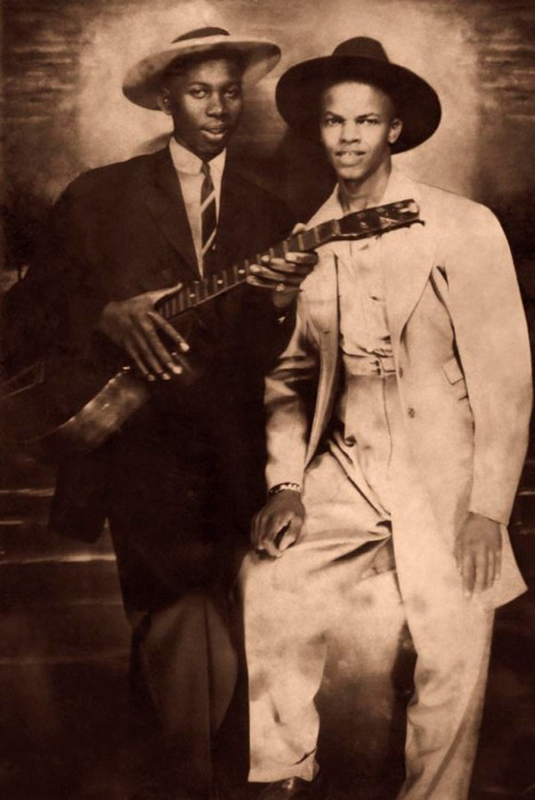 If we briefly accept your theory that both “Johnny Shines” and “Robert Johnson” decided to wear women’s clothes for this photo, how do you explain the fact that both David “Honeyboy” Edwards and Robert Lockwood Jr (two musicians who knew Shines & Johnson well) refused to confirm these IDs? Johnny Shines didn’t have that gap in his teeth, and don’t tell me he got braces later in his life. The nose on the “Third Johnson” is completely different than the two known photos. Look at it close, blow it up, the “Third Johnson” figure has an almost pug nose, with a curved bridge. It is narrower at the base as well. I’m not a “blues scholar” as most of the people involved claim to be. What does that have to do with this debate? This is a study of facial character, anatomy and well how to manipulate a found photo for potential licensing and financial gain…and I don’t see a damn thing wrong with that. I’m a artist of over 40 years and a master photographic printer of over 30. 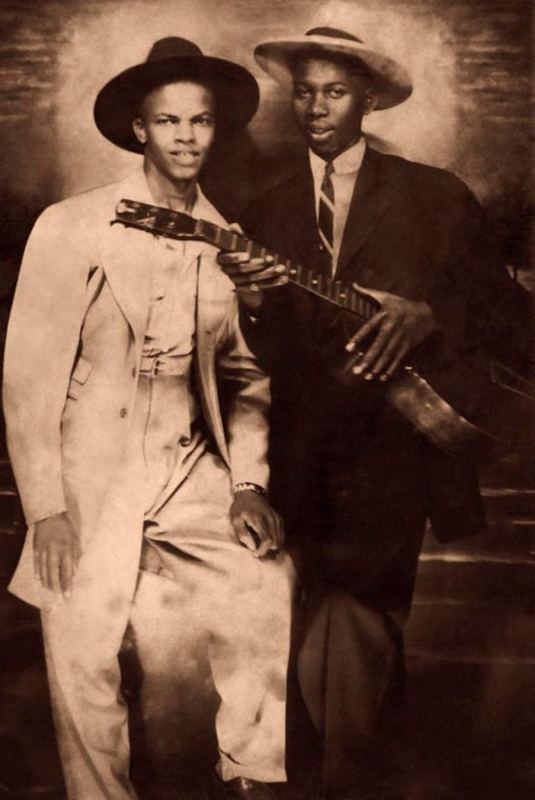 In my eye the features on these two young men do not match at all to the two known photos of Robert Johnson and what Shines would have looked like young. You start with the nose and work your way out, the answer reveals itself. That being said, one thing I know about art and seeing, much like the dead in The Sixth Sense-They only see what they want to see. After reading Chasing The Phantom I feel for that Zeke guy. I own a few unpublished photographs of Delta Bluesmen including one I believe is Charlie Patton with a group of other men & dancers playing guitars, he even has the guitar on his lap. But, why reveal it. I found it, I found him. I deserve it. I’ve come to the conclusion “Blues Scholars” like most people when they form groups become total dicks. I have not been proven wrong yet.